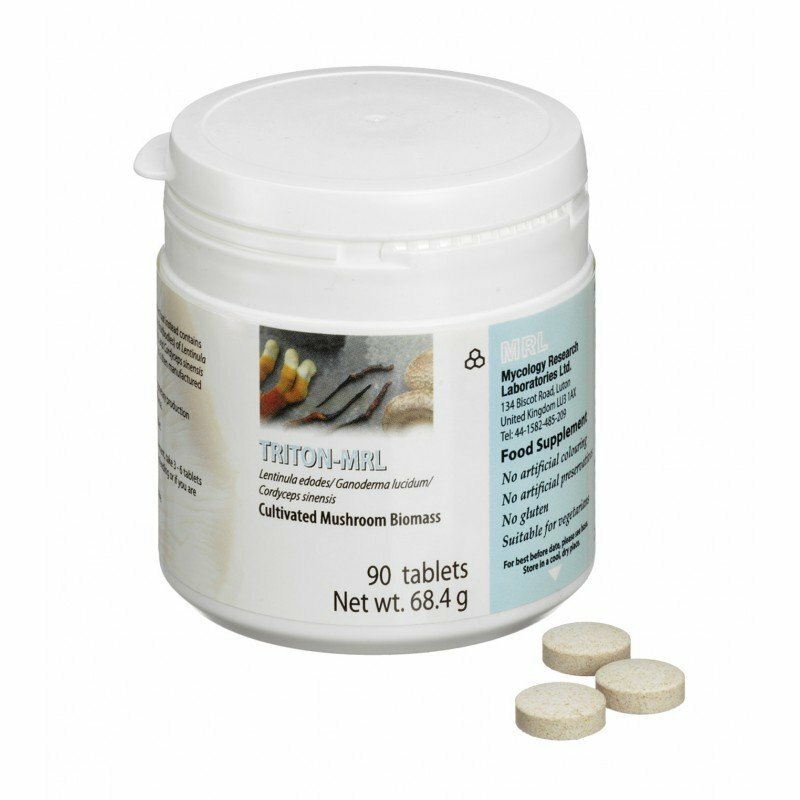 Triton-MRL Tablets contains both mushroom mycelium and primordia (young fruit body) of Ganoderma lucidium, Cordyceps sinensis and Lentinula edodes. Save 15% when you purchase 4 bottles. The fungal biomasses Cordyceps sinensis, Ganoderma lucidum and Lentinula edodes that comprises Triton-MRL is certified 100% Organic in the United States by Quality Assurance International (Certificate No. 103491-A). The choice of additives used in manufacture renders these tablets suitable for Kosher or vegetarian use. Triton contains both mushroom mycelium and primordia (young mushroom fruit body) of Ganoderma lucidium, Cordyceps sinensis and Lentinula edodes separately cultivated into biomasses that is grown on a sterilized (autoclaved) substrates. This cultivation process ensures the tablets are free from contamination by other fungi and that pesticides and heavy metals are absent. The cultivation system is proprietary, allowing for standardized production of Triton when mixed in equal amounts. The tablets are then sealed in plastic containers. The mixture of the three medicinal mushrooms is processed under rigorously controlled conditions that are applied to the manufacture of a conventional pharmaceutical. This ensures that each tablet contains 500mg of the standardised combination of Ganoderma lucidum, Cordyceps sinensis and Lentinula edodes.The tablets are film coated to protect them from moisture, thus preserving the quality of the product and ensuring a long shelf life.